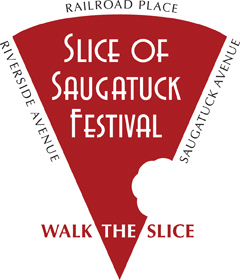 Slice of Saugatuck Festival: Tastings For All! After a highly successful event last year, this year on Saturday September 15, 2012 from noon - 3pm over three dozen of Saugatuck's finest restaurants, shops and galleries will be opening their doors and inviting the community to come and sample their offerings. Walk the streets of Saugatuck Center and taste your way from restaurant to restaurant, to liquor store, to retail merchant and back. Try some brick oven pizza, a specialty soup or a dish from Mario Batali's Tarry Lodge. Sample Bridge Square's Popadum Indian cuisine or Bistro 88. Everyone from CakeSuite to The Black Duck and Saugatuck Wine and Spirits will be giving out tastings so wear those stretchy pants. Listen to over 4 bands and stroll along the boardwalk at the plaza overlooking the river. Maybe even take a paddle on a SUP or kayak. There is so much to do for the whole family including checking out the Fire Department's antique fire engine or tour the historic Fire House which will be open to the public. Grab a map and see if you can taste everything being offered. Your stomach will be full before you get to the end. Restaurants / Caterers, 23 of them, will offer free tastings of their signature dishes right in front of their locations. Liquor Stores will offer free wine tastings. Retailers will offer kayak rides, gym work outs, fly fishing lessons, Environmental tips, discount coupons and martial arts demonstrations. At least 4 bands playing at venues throughout The Slice. All this for an all inclusive $5 participation fee. Profits will be donated to Homes for Hope, Gillespie Center Food Pantry. Parking is on Riverside Avenue under 95 in the RR lot #5, right next to the new plaza. Click here for the full map with all participants.